One of the biggest challenges for those involved in marketing is to be able to generate demand for the products they’re offering. In other words, they need to effectively address the funnel phase that corresponds to the consideration for the purchase. The Christmas season greatly facilitates this task, as the propensity to buy already exists in all consumers. We all look for Christmas gifts, and we all do it in the same way and at the same time. In this post, we have emphasized how purchasing drivers level out across the consumer types during the holiday season. In the month before Christmas, the challenge becomes finding the most effective way to respond to these needs. You need to stand out from the onslaught of communications and convince the user (who is already predisposed to buying) to make that purchase from us, and not from the others. The competition in inboxes is therefore very high. The user has to be (and wants to be) guided through their hunt for gifts, and what better tool could there be than a Christmas gift guide sent via email? There are many different ways to create your own gift guide, so here’s some inspiration. Minimal and straight to the point. This guide is nothing but a poster or teaser, indicating what the recipient will find on the site. It does not describe, but tempts readers to click, tickling their curiosity and stimulating the urge to shop. The trick: the important thing in this case is not to go unnoticed. A minimal message is effective if accompanied by a visual output that wows. Kate Spade provides an excellent example: a very simple copy made irresistible by sparkling glitter (added through an animated GIF). The trick: clarity is everything. Create a modular structure that allows for clear use and navigation, defining the categories in an obvious way and illustrating sections with explanatory images. The most universal and most difficult need of all: to find the right gift for your mom, husband, children, aunts, or all those people you give gifts throughout your whole life and for whom it is always a challenge to find something new. You can then create a separate gift guide according to their roles in people’s lives. 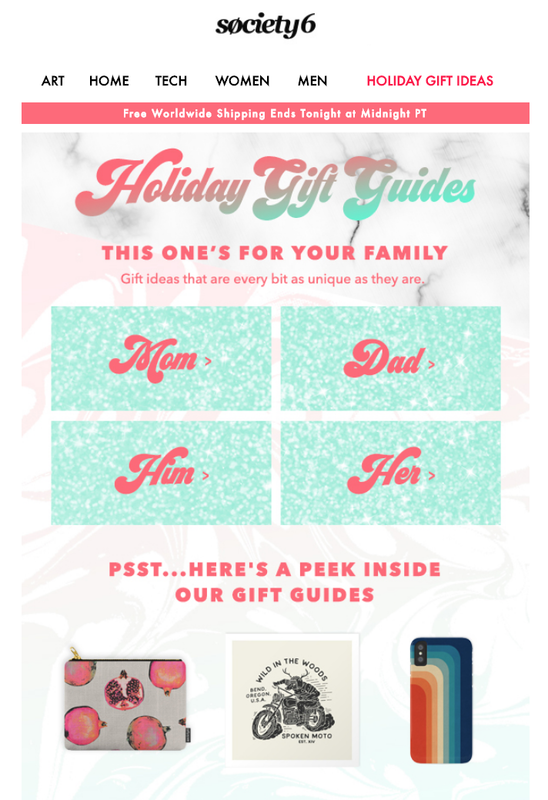 Another possible way of structuring a gift guide is to refer to behavioural differences instead of demographic ones. The principle is that the user is usually searching for more than one person and character profile. Facilitating their search based on the passions and hobbies of the recipients can provide valuable support for the buying experience. The trick: it is essential to know your public and their tastes very well. Start from the premise that gifts have to be liked by the person giving them first and foremost, and that this can be an important driver in the buying decision. Although we may not like to admit it, we all have a budget in mind for each gift. Guiding the purchase by dividing the products by price as well as just type can provide a good shortcut for encouraging purchases. It is possible to make further subdivisions within these macro-price categories, for example, small gifts for him or her, or for children, significant gifts for your wife, husband or parents, and so on. The examples shown so far use email as a showcase for displaying the different product categories based on previously selected criteria. Another possibility is to divide the communication of the gift guide into several thematic “installments”, with one per week, for example. This is what Notonthehighstreet does, as can be seen in the gallery below. It adds nuance to the gift theme through a drip campaign with a nostalgic and emotional tone – and it puts it center stage. Inboxes are beyond crowded over Christmas, and the fight for readers’ attention can be tough. This is why special attention should be paid to the graphic rendering of email messages, ensuring visual impact and staying in tune with the season. At the beginning of this article we mentioned Everywhere Shoppers, the increasingly widespread type of user who buys anywhere and under every circumstance – not just at home or in the office, but also on public transport, while at the cinema or in the queue for the pizzeria. Excellent performance by emails on smartphones is therefore a key requirement in order not to lose out on all these potential customers. This email by Harry’s, for example, is simple and clean, with a strong yet perfectly balanced color scheme. And for an extra touch? An animated GIF that creates movement at a specific point. It doesn’t just look nice: it’s also well constructed and optimized for smartphone use. In fact, the modular structure ensures that the blocks gathered together in the desktop version are rearranged one below the other in the mobile version. This allows for easy scrolling, good readability and great click potential. Bonus: if you use the BEE editor on the MailUp platform, all messages are already mobile-friendly! Let’s keeping reflecting on the Harry’s Gift Guide. 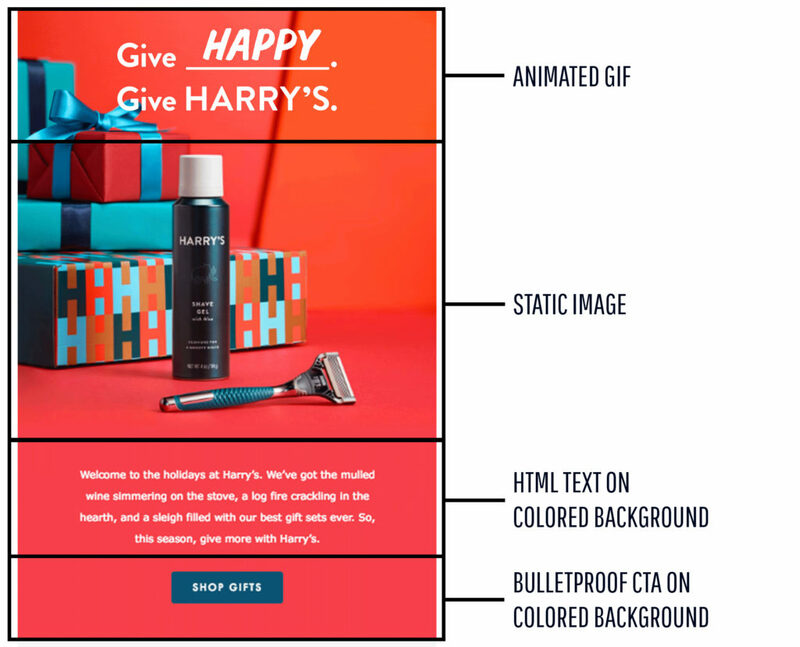 The easiest way to construct an email like this would be to include all the content of the first visual in an image, including the graphics, text and a “fake” CTA button. However, this could cause serious viewing problems if the images are not properly loaded. Moving images. GIFs are heavier than other types of image files, and this may slow down the loading of the email. To limit this damage, it is good to just save the part of the email that is actually moving as an animated GIF. You can find out more in this post. Static image. The part of the image that does not move is isolated and loaded as a normal Jpeg, reducing potential viewing problems. Text on a colored background. The MailUp BEE editor allows you to set the background color of the text sections, meaning you can create the illusion that it is the continuation of the image. At the same time, make sure that the text is still readable even if the image does not load, and allow font resizing so that it is also easy to read on small screens (compare the mobile display above). Bulletproof CTA button on colored background. The same goes for the bulletproof button, inserted in HTML on a colored background. Moving images can catch the eye and attract attention much more effectively than the static equivalent. The consequence is a general increase in message performance, especially in terms of click rates. Using animated GIFs in emails is easy, read up this post and discover how! 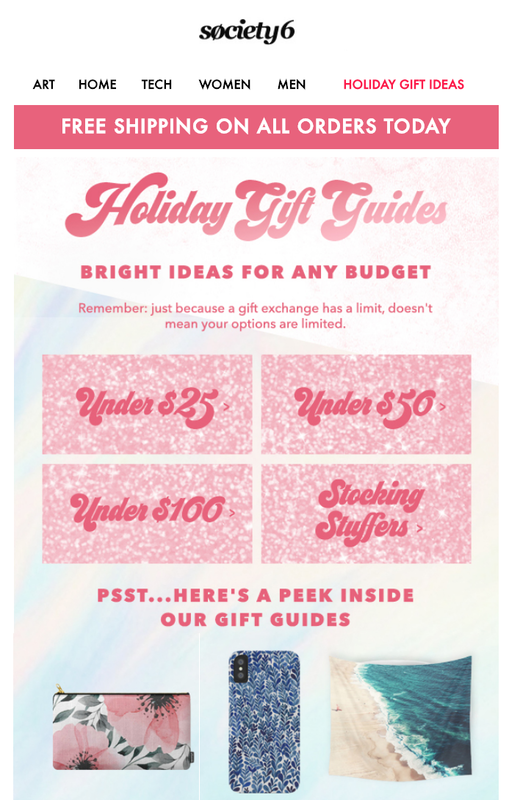 Even if you opt for a minimal gift guide that just consists of a teaser, you should always include reference links (or anchors) to the main categories you want to push (shown in red boxes in the email below). You will provide a simple and clear foothold for those who aren’t interested in browsing the entire selection, and prefer to go straight to the point. Why limit yourself to only recommending gifts? The potential of the holiday season is much greater for those who know how to take advantage of it: we all have a pre-Christmas dinner with colleagues and a New Year’s Eve party with relatives, we will all be looking for decorations for our homes and new recipes to try out during Christmas lunch. Birchbox knows this well, for example, which is why it has combined the classic gift guide with additional seasonal sections, to find the right look and inspiration for food and wine. It places emphasis on non-commercial content that has a great chance of success. The holiday season is a potential gold mine that should be properly guarded. 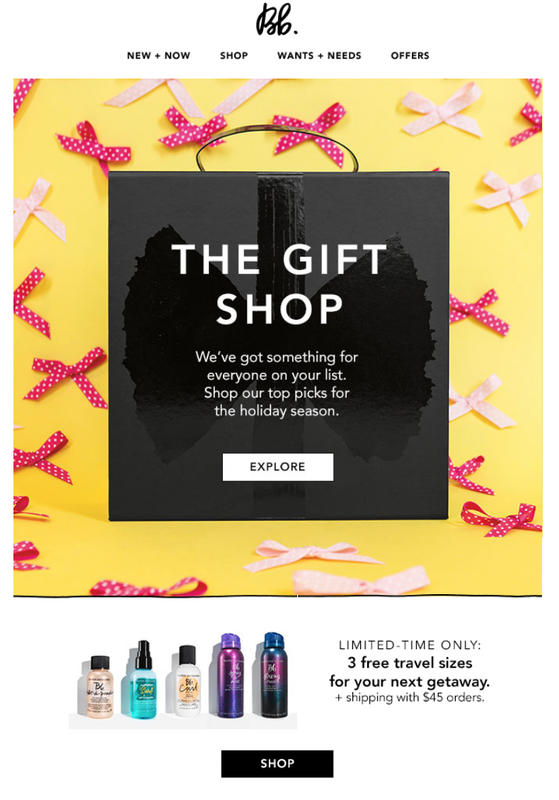 Use email to help your contacts find gifts by structuring a complete gift guide in a variety of ways. Let us know in the comments below which way you chose for your business and how it worked out!